As Autumn approaches and we hold on to those last lingering bits of summer, I can’t help but feel a little remorse. As is the story of each passing summer, I never complete my “to-do” list. “Spend more time at the beach, build a giant sand squid, clean out the shed”, the list is endless. It’s just too dang hot and if you know me, you know I am not a big fan of the summer sun. So, here we are, neglected lists in hand, summer lawns fading and the promise of pumpkin spice in the back of our minds. This girl won’t miss you, Summer..But I sure do wish I had cleaned out that shed. Keke – Bottle of water & glasses Part of the “Hard to Find” set. Sold Sep.
Plants , plants and plants! 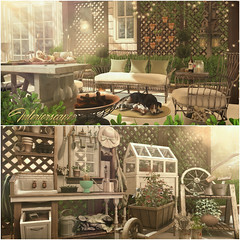 Kalopsia – Various potted plants from the “Old Plants” set.